Your neighborhood window treatment experts! Window treatments (or window fashions) are popular in homes and other residences because they combine style and function. They can, for example, add to any room design, while also regulating sunlight and increasing privacy. Gordon’s Carpet One is your one-stop-shop for window treatments, as we offer high-quality options from some of the more popular brands in the industry. There are two types of window treatments: hard window treatments and soft window treatments. Hard window treatments, including blinds, shutters, and shades, are popular because they can regulate sunlight and outside noise. So, they are great if you want to maintain privacy in your home. At the same time, hard window treatments are available in different style options (including natural wood), and they are relatively easy to clean and maintain. For extra style, be sure to take a look at soft window treatments such as curtains and drapes. Soft window treatments are usually made from fabrics, so they aren’t as functional as hard window treatments. In other words, they aren’t meant to maintain privacy. But, they are more comfortable and more design-focused, so they can certainly add luxury to your setting. We offer custom drapes as part of our soft window treatment selection. With custom drapes, you can add unique style and personality to your home. Click here to learn more about our custom drapes services. We’re happy to offer window treatments from Hunter Douglas and Skandia. Hunter Douglas is the most popular name in the industry, and it certainly offers the largest selection. We especially love the Alustra Collection! Visit our Hunter Douglas page. 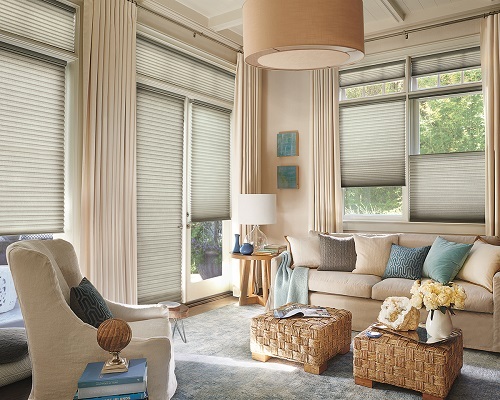 Skandia, too, offers many different window treatment options, including window blinds and cellular shades. Be sure to visit our El Centro, CA showroom to learn more about our selection of window treatments. Our design team will help you make the best choice for your home setting!